Hunza was an independent principality for 900 years. The British gained control of Hunza and the neighbouring valley of Nagar after the Hunza-Naga Campaign in 1891, as the British suspected Russian involvement "with the Rulers of the petty States on the northern boundary of Kashmir;". The Tham (Chief/Mir) of Hunza escaped to China. The princely state of Hunza was a cause of great trouble and nuisance in the end of the 19th century for the Political Agent of Gilgit Coloel. Aiglernon Durand ,who was a representative of the British Empire. 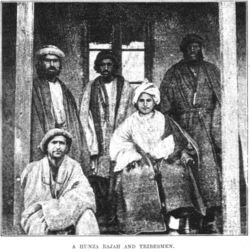 The Hunza state possessed of the important mountain passes Mintak pass and Kilik pass, from where Captain Gromechevsky of the Russian Empire entered Hunza in 1888 with six Cossack escorts who were received cordially by the ruler of Hunza Mir Safdar Ali. Before his return, he also promised with Mir Safdar Ali to come back with important proposals from his empire. This act of temerity by the Captain Gromechvsky and his host Mir Safdar Ali was considered by the Political Agent of Gilgit as an open threat to the British Empire. He informed the Foreign Secretary of British Government of India about the alarming situation in Hunza. The Political Agent was so deeply obsessed about the Russian political penetration in the region, that he seized three foreigners, taking them for Russians, from Chitral, and sent them to India as prisoners. But later on the foreigners were turn out to be the famous French explorers who entered to Chitral from the Central Asia. Captain Francis Younghusband entered to Hunza by the Shimshal Pass in 1889 and also met with Captain Gromchevsky, who was roaming in the region due to the political motivation of the Russain Empire, at ceremonial camp fire with toast of vodka and brandy, each expressed the rights and interests of their respective empire in the region. Francis Younghusband noticed the map of his counterpart was marked in red the land « where the three empires meet,” China, Afghanistan, and British Empire, with the immediate effect of vodka, Captain Gomechesky boasted haughtily about the Russian Empire military power: That will not less than 400,000 professional soldiers to seize the British India, moreover the Indian population will be in revolt as they were oppressed by the British Empire. Francis Younghusband after bidding farewell to his Russian counterpart, he made his way to accomplish his second official mission to meet Mir Safdar Ali ruler of Hunza in his seasonal residence in Gulmit village. The Mir of Hunza arranged to receive his guest with 13 guns salute and with great fanfare of the local music, which was impressive for his host but deafening. A court man was sent in advance to inform him about the 13 guns salute in his honor as the emissary of the British Empire, so he should not be afraid or think any ill-motivation of his host, but when he reached in the court of Mir.Safdar Ali to the extreme astonishment of Francis Younghusband, there was no chair for him in the audience of the court , where the all his court men were squatted in front of his throne, and he himself was seated in a proud, conceited posture. Captain Francis Younghusband was in the British army uniform, he was an envoy of the greatest sovereign on earth, where sun never set on the British Empire in the world, he expected that the Mir should treat him properly. Anyway, he managed to get a chair by sending one of his soldier from his camp and set down near the throne of the Mir. But soon he realized that Mir Safdar Ali have misconception and very high opinion of his own authority, he proposed an invitation to the Mir to visit India, the Mir curtly replied that, it is not the custom for a great king like himself, to leave his kingdom. In 1847, Nathu Shah a commandant of the Sikhs of the Punjab, with the help of his ally Karim Khan of Gilgit, attacked Hunza as reprisal for the raids on Gilgit territory: Despite the fact that the two allies were well prepared, the Hunzas triumphed and Nathu Shah and his allied were killed in battle. In 1866 again the Dogras of Kashmir invaded in reprisal for raids, with the help of people from Nagir the new allies deserted in the large numbers with the result that the Dogras ran for their lives in panic.. In 1889, Hunza and Nagir Mirs entered into a treaty with Colonel Duran. Both Mirs agreed according to the British proposed treaty to put end the raiding on the Yarkand routes. It was also included in the British treaty to allow the accredited British officers to travel through Hunza and Nagir. According to the agreement the British Government of India will grant a yearly allowance to the both Mirs . After some time Mir Safdar Ali declared the treaty null and void, and restarted the raiding on the Caravan on the old Silk route, pretending that it was the only source of income for his state, and he also blocked the passage of the Diplomatic Bag of the British Empire for the British Council in Kashghar. The attitude of the Mir of Hunza made Colonel Durand furious and decided to attack Hunza and Nagir without wasting time, with two thousands Gurkhas, Kashmiris, pathan soldiers. When he received the news of falling the Nilt Fort of Nagir in the hands of British, . He decided without losing time with his cohorts and cronies to fled away to Sikiang and seek political asylum. A new chapter commenced in Hunza by replacing Mir Safdar Ali by his step brother Nazim Khan and Uzr Khan by his brother Sikander Khan in Nagir by the king maker British Political Agent. According to Colonel Schomberg a British traveler of beginning of 20th century to Hunza and central asia, who gave a different opinion about Mir Safdar Ali that he never received justice from British authorities, his kingdom was taken from him without allowing him to speak in his own defense. The British Empire did not even propose a small allowance as compensation ,as he was not British subject. He was moreover encouraged by the Chinese to go to war against the British Empire. Colonel Schomber portrayed him as a polite and well learned gentleman, he never disparaged his step brother who replaced him in Hunza, forgot his mother tongue Brushaski, spoke flawless Persian, and died in Kashgar in 1930, as political refugee.. .. The Great game written by PETTER HOPKIRK. Where three empires meet by E.F KNIGHT. Different a times you might be obliged to require rental auto affiliation e.g. running with family, going on business visit to other city, going to office social gatherings abroad and so forth. Rent a car Rawalpindi While running up against with these conditions your decision of attempting Rent Car Islamabad is resolved to be a predominant than the ordinary decision as open transportation won't not be possible or available. If you are running with family you will be not able regard all the security that you require while going out in individuals when all is said in done transport.